NuGet Gallery | Packages matching Tags:"shortcut"
22 packages returned for Tags:"shortcut"
Easy easter eggs (konami code, etc) for your WPF projects. 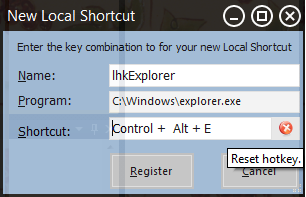 Shortcut allows you to get up and running with system wide hotkeys (sometimes called global hotkeys) quickly and easily. Easy easter eggs (konami code, etc) for your .NET projects. Vigilant Always Vigilant. Vigilant is the solution i found to create several shortcuts in a page or for different objects in a simple way. Provides manager for keybinding where key gesture can be configured by user. This library allows you to register application wide or global hotkeys. It can be used to register hotkeys (one key, possibly multiple modifiers, like "ctrl+alt+j") and chords (multi key hotkeys, like "ctrl+k, ctrl+c" or "ctrl+alt+x, b, q"). This article shows how to register and manage System-Global hotkeys in WinForm applications and performing some keyboard manipulation from your app and has a custom hotkey control. An easy way to setup global key shortcuts on your WPF app. An easy way to setup global key shortcuts on your WinForms app. Shortcut to throw exceptions to make defensive programming fun and more effective. Non intrusive.